Two rockstar XYPN members share their tricks for juggling the demands of a growing business while managing life. Is it possible to keep your sanity while doing the heavy lifting as a "solopreneur"? 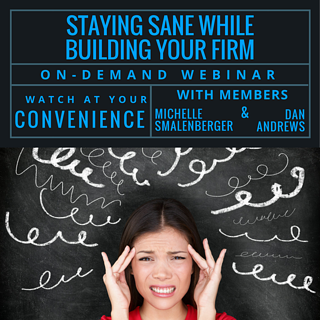 Hear from the voice of experience in this 60-minute on-demand webinar. How Much Experience Is Needed To Launch a Firm? Or Do You Even Need Experience? Who Were Your Cheerleaders In Your First Year? Panelist: Michelle Smalenberger, CFP® of Financial Design Studio, Inc. has a passion for helping others develop a path to financial success! Through different lenses on a financial picture, she wants to help create solutions that are thoughtful of today and the future. Those who are a great fit for her services are families working hard to provide for and support each other and individuals who want to ensure they are making the right decisions to secure a strong financial foundation. She enjoys providing financial education and helping others. Find Michelle on Twitter: @SmallsFDS.